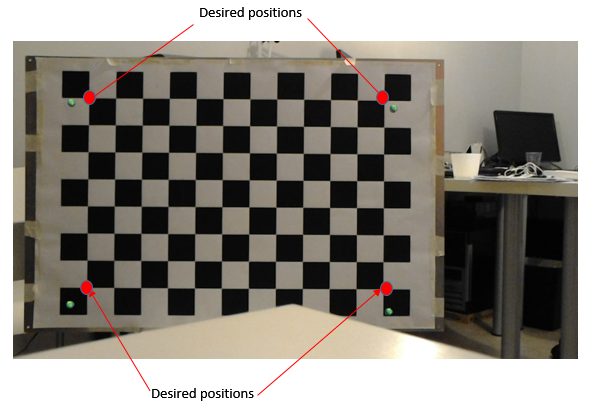 I am trying to use augmented reality with HoloLens using my own marker detector, just as described in the Locatable Camera documentation https://developer.microsoft.com/en-us/windows/holographic/locatable_camera (at the paragraph Tag / Pattern / Poster / Object Tracking). I am failing in drawing precise spot holograms at the corners of my marker (for now it’s just a chessboard). 3. (3,3) element is -1 … ? what’s that???? With rotation and translation from chessboard to camera, I get the chessboard points in camera coordinates. Unfortunately, the spheres are not aligned in the desired positions (red points). Does anyone have any idea of this? Do you think the problem is with the estimation of the coordinates or with the rendering in Unity? […] however the undistortion function in the image processor may still leave an error of up to 10 pixels when using the projection matrix in the frame metadata. In many use cases, this error will not matter, but if you are aligning holograms to real world posters/markers, for example, and you notice a <10px offset (roughly 11mm for holograms positioned 2 meters away) this distortion error could be the cause. I think I can answer some of this. First, make sure you're setting the focus point/plane to the area you want to optimize the alignment of. Anyway, I'm currently in the process of doing projective texture mapping of the camera image onto the spatial mesh, but because of the distortion error (which, for all their claims of being <10px, is noticeable to the levels you're seeing as well), I'm trying to refine the camera model by using OpenCV to find some distortion coefficients. From working backwards through the "Painting the world" shader example (https://developer.microsoft.com/en-us/windows/holographic/locatable_camera#painting_the_world_using_a_camera_shader), I determined what the values of fx, fy, cx, and cy should be to result in the same transformation, given that we know a, b, c, and d.
Note: The result of using this projection matrix in the typical OpenCV way will still require one more step at the end. Assuming you get a value (x,y) that is the normalized [0 to 1] coordinates of a location on the camera image, you have to finally change it to (1-x, 1-y). The reason this final transformation isn't incorporated into the definition of fx/fy/cx/cy above is that it would result in a negative value for fx and fy, which OpenCV doesn't like. My point with this is that I believe that the offset you are seeing is in fact the result of the projection error. I recommend seeing if the offset of your markers with the real world swims around as the camera moves left/right/up/down. If so, that may indicate radial distortion. I've found some marginal success by using the HoloLens projection matrix, converting it into an OpenCV-friendly format, then using it as an fixed value to solve for distortion coefficients.